Red Clover is widely grown throughout the United States and Canada. Red Clover is often grown in areas with low soil pH or fertility, and poor soil drainage. Traditionally, red clover is cut twice a year when it is at 50% bloom or greater. With this harvest system farmers end up cutting too late to obtain maximum forage quality. More recently, farmers have been cutting red clover three times during the summer to get a higher quality forage. However, with a three-cut system, farmers are concerned that they may give up yield and persistence. Red clover cultivars that were developed during the 1970s and 1980s proved to be higher yielding, more disease resistant, and persistent than those that were developed prior to 1970. Since newer cultivars are more persistent they may be able to tolerate three cuts per season without loss of stand. Researchers at the University of Wisconsin wanted to determine what cutting systems best optimized red clover yield and quality while maintaining high stand persistence. This Focus on Forage will discuss the effect of harvest management on red clover yield, quality, and persistence. Red clover varieties were evaluated for forage yield, forage quality, and persistence. Overall, there were insignificant forage yield differences among varieties. However, significant forage yield and quality differences were measured among harvest management systems. What cut system produced the most forage per season? Red clover yield is influenced by the growing conditions of each year and location. In general, red clover is more productive in southern Wisconsin where the growing season is longer as compared to northern Wisconsin. However, red clover is particularly sensitive to soil moisture conditions, and forage productivity can be limited with dry soil conditions. Red clover forage yield will vary depending on the stage of maturity at harvest. Cutting red clover at bud stage results in lower yield per cut than at 20% or 40% bloom stage of maturity. In general, dry matter accumulation is at its highest by the time red clover reaches the 20% bloom stage of maturity. When comparing the various cut systems for total season yield, the three-cut system was the highest yielding system (Figure 1). Two-cut systems were lower yielding than three and four cut systems. The four-cut system produced high yields, but the economics of taking the fourth cut in fall are generally not favorable. One concern with taking a fall harvest is forage persistence and yield potential in the following year. This study showed that fall harvest did not significantly reduce forage yield the following year. Fall harvest after a killing frost (or after October 15th) is a viable option for red clover harvested two or three times prior to September 1st. Will forage quality differ among cut systems? Forages cut at bud stage had the highest concentration of crude protein (CP) and lowest concentration of neutral detergent fiber (NDF) and acid detergent fiber (ADF). Forages cut at 20% bloom had forage quality that was slightly lower than bud stage clover. 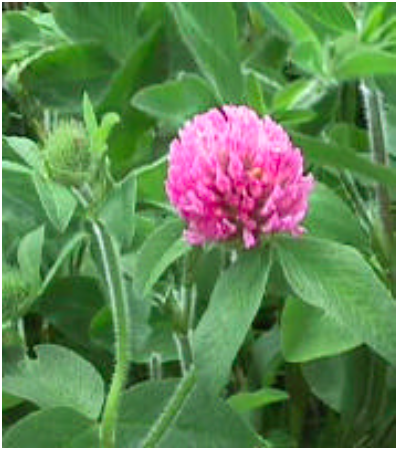 Harvesting red clover at 40% bloom results in forage quality that is lower than forages cut at 20% bloom or bud stage. Maximum nutrient yields are obtained by harvesting red clover when the plants are between bud stage and 20% bloom. What cut system will maximize red clover persistence? 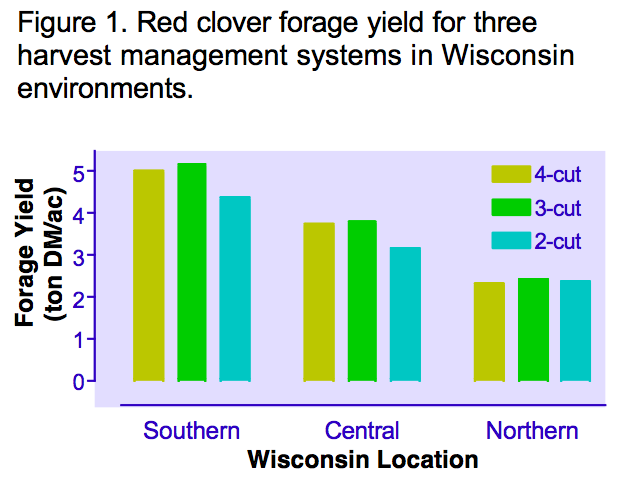 In this study, harvest management systems did not affect red clover persistence. In fact when red clover has a lot of late summer or fall regrowth, it may be better to harvest the crop to reduce the risk of winter smothering. Because red clover has a succulent, non fibrous stem with large leaves there is some danger of residue smothering red clover plants and reducing stand over winter. There were no detrimental effects on stand persistence due to fall cutting in the three or four cut systems tested. Red clover harvested three times (2 summer cuts + a late fall cut) at 20% bloom yielded the most total forage in Wisconsin studies. Red clover cut at 20% bloom was also high in forage quality and persistence. The highest nutrient content and digestibility came from red clover forages cut at the bud stage of growth, but came at the expense of forage yield. Harvesting forage at 40% bloom had the lowest nutrient value and the lowest yield. Farmers should harvest red clover three times (2 summer cuts + a late fall cut) when it is between bud stage and 20% bloom stage for optimum forage yield, quality, and persistence. Wiersma, D.W., R.R. Smith, M.J. Mlynarek, R.E. Rand, D.K. Sharpee, and D.J. Undersander. 1998. Harvest management effects on red clover forage yield, quality, and persistence. J. Prod. Agric. 11:309-313.